The dogmatization of the Assumptio Mariae points to the hieros gamos in the pleroma, and this in turn implies . . . the future birth of the divine child, who, in accordance with the divine trend towards incarnation, will choose as his birthplace the empirical man. The metaphysical process is known to the psychology of the unconscious as The Individuation Process. ~Carl Jung, Jung, "Answer to Job," Psychology and Religion, CW 11, par. 755. The nuptial union in the thalamus (bridal-chamber) signifies the hieros gamos, and this in turn is the first step towards incarnation, towards the birth of the saviour who, since antiquity, was thought of as the filius solis et lunae, the filius sapientiae, and the equivalent of Christ. When, therefore, a longing for the exaltation of the Mother of God passes through the people, this tendency, if thought to its logical conclusion, means the desire for the birth of a saviour, a peacemaker, a "mediator pacem faciens inter inimicos." Although he is already born in the pleroma, his birth in time can only be accomplished when it is perceived, recognized, and declared by man. ~Carl Jung, Jung, "Answer to Job," Psychology and Religion, CW 11, par. 748. The taking up of the body had long been emphasized as an historical and material event, and the alchemists could therefore make use of the representations of the Assumption in describing the glorification of matter in the opus. The illustration of this process in Reusner's Pandora shows, underneath the coronation scene, a kind of shield between the emblems of Matthew and Luke, on which is depicted the extraction of Mercurius from the prima materia. The extracted spirit appears in monstrous form: the head is surrounded by a halo, and reminds us of the traditional head of Christ, but the arms are snakes and the lower half of the body resembles a stylized fish's tail. 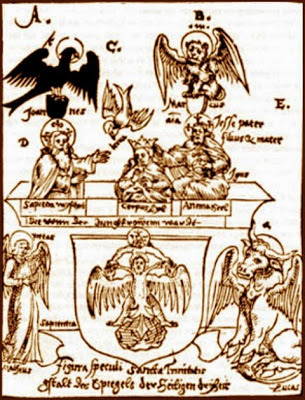 This is without doubt the anima mundi who has been freed from the shackles of matter, the filius macrocosmi or Mercurius-Anthropos, who, because of his double nature, is not only spiritual and physical but unites in himself the morally highest and lowest. The illustration in Pandora points to the great secret which the alchemists dimly felt was implicit in the Assumption. The proverbial darkness of sublunary matter has always been associated with the "prince of this world," the devil. He is the metaphysical figure who is excluded from the Trinity but who, as the counterpart of Christ, is the sine qua non of the drama of redemption. His equivalent in alchemy is the dark side of Mercurius duplex and . . . the active sulphur. He also conceals himself in the poisonous dragon, the preliminary, chthonic form of the lapis aethereus. ~Carl Jung, Mysterium Coniunctionis, CW 14, par. 238.